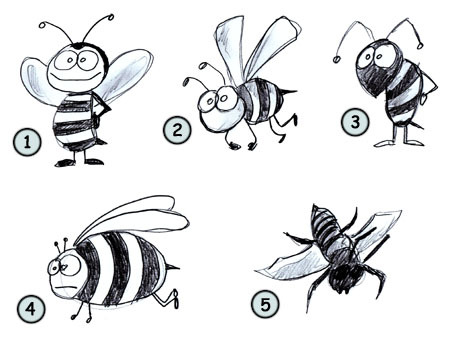 Drawing a cartoon bee: some fun facts before starting sketching! In her lifetime, a worker bee will make around 1 teaspoon of honey. In one trip, a honey bee will land on 75 different flowers. Honey is made of 25% water and 75% sugars. This insect is very easy to recognize. They have a sting (1), a black and yellow abdomen (2) and small forelegs (3). They also have small antenna on the head and sharp mouth parts (4). The two wings (5) are located near the head. Also, even if it's not clear in this picture, the bee has two middle legs and two hind legs. The bee is made of simple basic shapes. A circle for the head, another one for the body (or the abdomen) and triangles for the wings. The foreleg is made of four small rectangles. 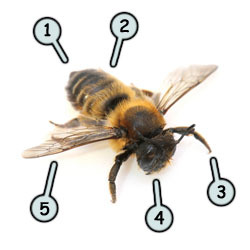 In this example, we are not able to see the fourth one since it is located under the body of the bee. The antenna is made of a line (with a junction in the middle). A small triangle will represent the sting (once again, it's under the bee, so not visible from this angle). I choose to draw a simple bee for this example. Start by drawing two circles, one for the head and another one for the body. Notice how the circle representing the head is irregular. Next, draw the two wings using rectangles. The part near the body should be a little narrower. Then, draw the front legs and the back legs. Add the antennas and draw some lines on the body to form the stripes. Add color to your artwork and enjoy! Drawing cartoon bees should not be so difficult once your practice a little. You can try to draw a more realistic bee (5) or try a more funny looking one (1). Don't hesitate to play with each part of this insect to create original drawings (4). Happy drawing!